Now you can witness the final mission of Cassini and enjoy the beauty of Saturn's rings and the moon in your own room. NAOJ has released the latest version (1.4) of the astronomical software Mitaka with many new features. 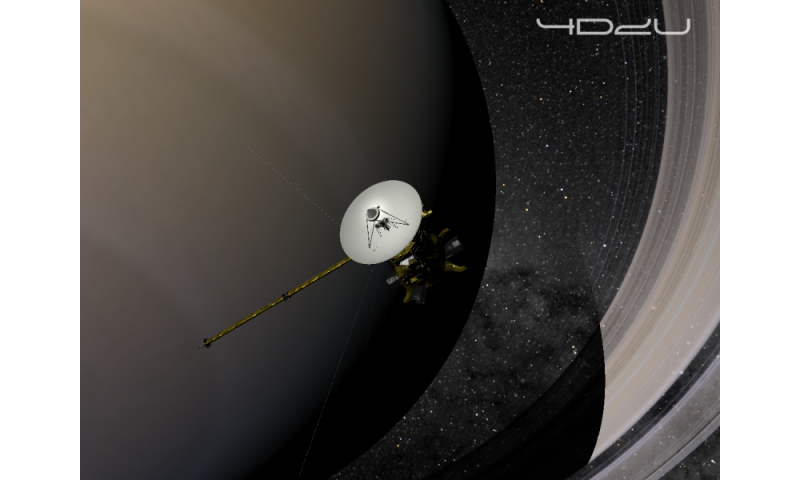 Mitaka version 1.4 can reproduce Cassini's Grand Finale mission. Also, the moon and Saturn's rings are displayed based on more realistic physical models for light scattering. Moreover, Chinese has been added to the available languages. The NAOJ Four-Dimensional Digital Universe (4D2U) Project has developed the space viewer Mitaka which can interactively display various celestial bodies and the hierarchical structure of the Universe using astronomical data from observations and theoretical studies. You can download this software for free at the 4D2U project web page and play with it on your computer. The latest version, 1.4, was released in September 2017. In this version, we can reproduce the end of NASA's Cassini spacecraft, which will dive into Saturn on September 15, 2017 as its Grand Finale mission. We updated the orbital data for Cassini's plunge into Saturn, and also the three-dimensional model of the spacecraft. We hope Mitaka will help when you talk about Cassini's Grand Finale in your classes and lectures. Many other features have been added as well, such as a texture map of the Milky Way created from the location and magnitude data of 1.1 billion stars obtained by ESA's Gaia spacecraft , and features to customize settings for live shows and on-screen menus. At the same time, we also released "Mitaka for VR version 1.4." You can enjoy the Mitaka universe with a virtual reality (VR) headset. Mitaka for VR gives you the experience of the realistic universe, extending in all directions.